Two deputies assigned to patrol during the early morning hours made a significant drug seizure and arrest during a routine contact early Friday morning. James Deroze, 27, of Arleta, was arrested for possession of a controlled substance for sale and reasonable cause, as well as receiving stolen property. Deroze was also charged with his outstanding warrant for his arrest. While conducting a patrol check in the parking lot of a local bowling alley located in the 21600 block of Soledad Canyon Road, deputies saw a man sitting inside a vehicle at approximately 12:30 a.m.
“These deputies were being proactive during patrol and it led to the seizure of a substantial amount of illegal narcotics,” said Deputy Josh Dubin of the Santa Clarita Valley Sheriff’s Station. Deputies began to have a conversation with the man, at which point they discovered the man had search conditions as part of the terms of his early release under California’s AB 109 Post Release Community Supervision program. The man also had a “no bail” outstanding felony warrant for his arrest. This means he was already wanted for a parole violation at the time of his arrest. In addition to a large quantity of legal black market drugs, he also had cocaine and methamphetamine in his possession. Deputies searched the man’s vehicle and recovered large quantities of methamphetamine and cocaine. 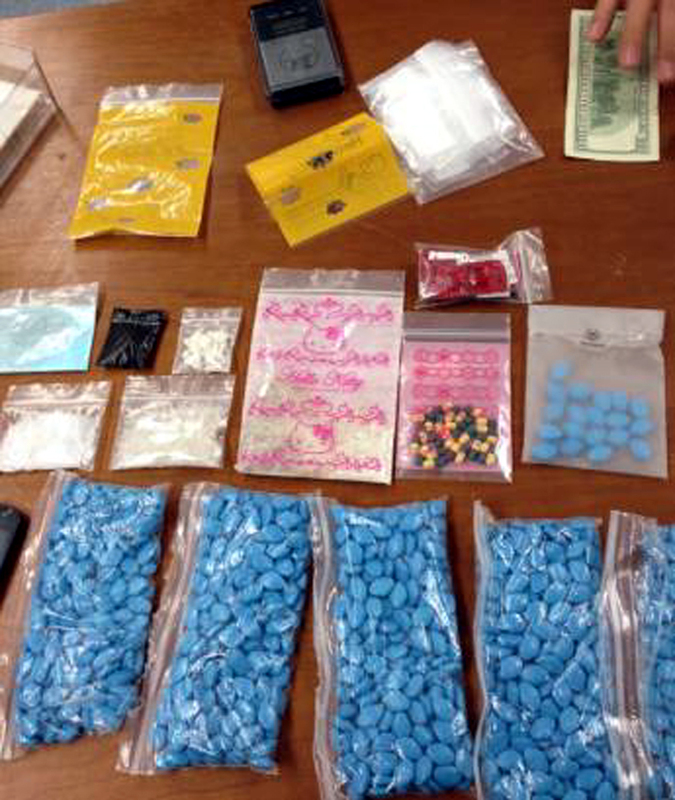 Deputies also recovered a baggie containing over 20 unknown types of pills, along with six additional baggies containing over 900 blue Viagra pills. In continuing their search, deputies also recovered 6 cellphones, 2 air soft style replica firearms, a car stereo, speakers, a webcam, US currency, and a scale. Deroze was booked at the Santa Clarita Valley Sheriff’s Station and is currently being held without bail. Deroze’s vehicle was towed and stored from the location. “Many of our deputies assigned to the Santa Clarita Valley station not only work here, but reside in the area, and take great pride in our community,” Dubin said.